You can hit the open road, discover misty seaports and mining legends. It has much to offer in the way of entertaining and eye-opening experiences. You can dance with daisies, feast with the First People or just get out into the vast desert sands of the Nama or the Kalahari. This, however, is about one of the more luxurious and leisurely experiences - a day and night spent 'glamping' at the Namaqua Flowers Beach Camp. Make sure to check out Beach Flower Camps. Located just north of the Groenrivier entrance to the Namaqua National Park, right on the beach, these luxury tents are a great launchpad from which to explore and enjoy the amazing scenery in the park. The tents all face the mighty Atlantic Ocean so visitors can enjoy a gorgeous ocean vista and accompanying sunset. The camp is the perfect place to settle down for a bit before heading out to explore the coastline and all the flowers and succulents in the area. With each tent being equipped with comfortable duvets, electric blankets and ambient bed lamps - you can rest in ease here. The ablution facilities include en-suite hot showers (perfectly heated to your requirements by friendly attendants), flush toilets and luxury amenities and towels. This certainly must meet the definition of glamping. Of course, it would be no fun if there was no chilled, neutral space where one could relax and unwind that isn't the sleeping tent or the national park itself - this is where the Daisy Lounge steps in. Guided at night by a trail of illuminated lanterns, visitors can reach the common lounge area. Here in the Daisy Lounge, you can rest easy, enjoy a high tea or stay a while after dinner for sundowners at their well-stocked bar. The Namaqua Flower Camps have something of a reputation with regards to their delightful gastronomic experiences on offer. Prepared in a remote kitchen by a private chef, everything from the breakfasts to the wholesome high tea treats to the hearty, authentic and satisfying dinners are prepared with immaculate attention to detail and taste. The Skilpad Wild Flower Reserve is just north-west of Garies and forms part of the Namaqua National Park. 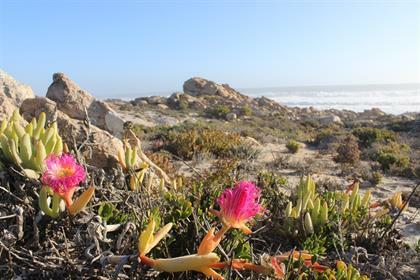 The coastal section of the Namaqua National Park is a wondrous place to enjoy the unrefined natural beauty of the Northern Cape. Coastal flowers include gorgeous vygies and hardy succulents. Take some time to explore the area and see the flowers and succulents around the area or just have some sundowners on the rocks by the beach. It's all possible here. Head out around the Namaqua National Park a bit and you may even be fortunate enough to spot a flamboyance of flamingos causally meandering about. The colourful flowers and succulents of the Northern Cape can be seen in their glory here too. The often romantic and always playful pinks, mauves and magentas adorn the coastline for kilometres on end. From the rugged vast coastline of Namaqua National Park to the seemingly endless vistas in Skilpad, you can not leave this space without being affected in some way. So stick around or head out of the park and do some more Northern Cape exploration.